Cherry and I were ready to start hiking again! This time, we decided to focus on trails in Haddam, her hometown. We used www.haddamtrails.org as our guide. It turns out there were thirteen trails in town, of which we’d already hiked one as part of the Mattabessett Trail. There also were three in Cockaponset and we’d tried some of that already. So, today, we started with Higganum Reservoir Trail. A round-trip of about a mile and a half, we knew it wouldn’t take long. It was a cloudy day with temperatures in the fifties, which made for a perfect hike. 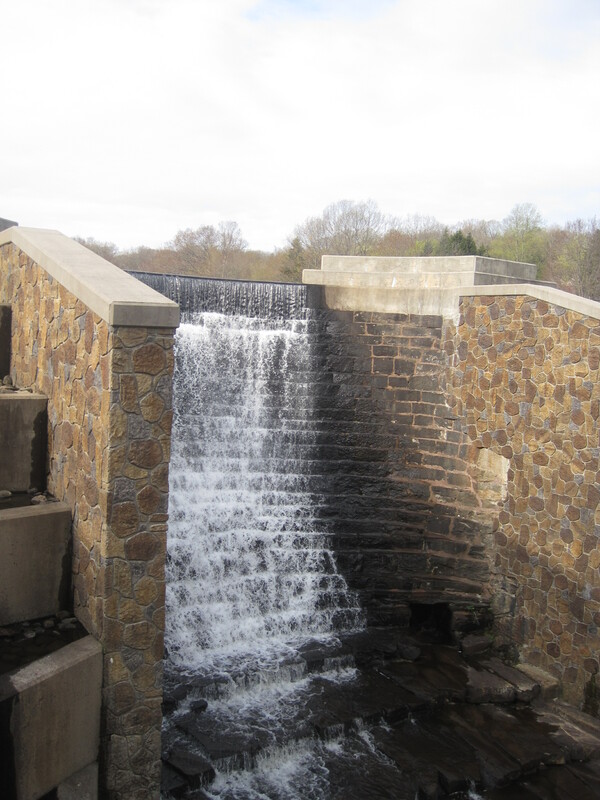 At 8:30, we parked at the north end of the reservoir to look at the spillway, comprised of large brownstone slabs. We then meandered through a nearby cemetery to reach Hull Avenue and locate the trailhead. We talked about Cherry’s upcoming retirement and issues related to continuation of her programs once she was gone. She also shared about a potential trip she might take to Buenos Aires in January, which sounded quite exciting. We were disappointed that the trail was so far from the reservoir, so we bushwhacked down to it and tried to follow along. We did get a few nice views of the waterway, while we talked about the current state of my writing. I talked about an in-progress short story and challenges in completing it by Thursday and Cherry was encouraging about its plot line. Seeing no clear way to continue along the reservoir, we returned to the trail and encountered two women walking three barking dogs. 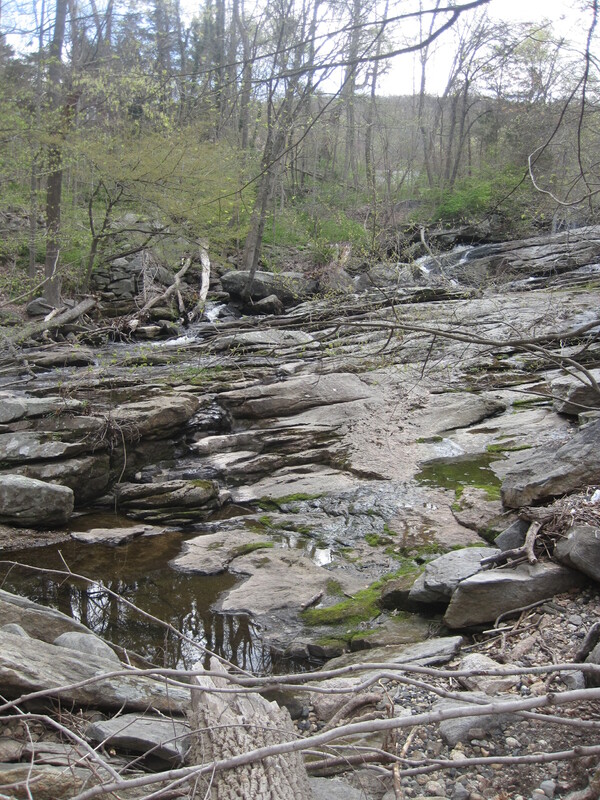 We were glad to move past them and find the source of the reservoir, a lovely stream flowing over rock outcrops. Reaching the other trailhead, we backtracked, staying on the official trail. Cherry asked about my recent trip to Stockholm and Denmark and I told her about the various foods and sights we’d seen. By then, we had returned to our parked car. Since it was still early, we decided to hike along the railroad tracks along the river in the center of town. Not an official trail, it crossed Higganum Cove (a superfund site containing PCBs, municipal solid waste, and asbestos.) before reaching the river. Being very low tide, we were able to explore the small beach before hiking north along the tracks. After a half hour, we turned and retraced our steps and returned to our cars at 11:30AM. Cherry hadn’t been to either of these areas, so we had a nice introduction to Haddam’s trails. To top it off, we decided to lunch at Mamma Roux’s on chili and gumbo. Cherry suggested a plan for future adventures that included selecting a Connecticut town and spending the day exploring trails, shops, and museums, and sampling a restaurant. I didn’t hesitate to agree. We’ll pick our first town after retirement at the end of June. Meanwhile, we’ll head back to Haddam in May to sample another trail or two. An little extra for today!